Marc Garneau has served his country his entire professional career, beginning with the Canadian Navy, then as an astronaut and President of the Canadian Space Agency, and now in political life. Marc began his service to Canada as a navy combat systems engineer in HMCS Algonquin from 1974 to 1976. He was promoted to commander in 1982 while at Staff College and was transferred to Ottawa in 1983. In January 1986, he was promoted to naval captain and retired from the navy in 1989. Marc was one of six Canadian astronauts selected out of over four thousand candidates in December 1983. He was seconded to the Canadian Astronaut Program from the Department of National Defence in February 1984 to begin astronaut training. Marc made history by becoming the first Canadian astronaut to fly in space as a payload specialist on Shuttle Mission 41-G, October 5-13, 1984. In 1989 Marc was named Deputy Director of the Canadian Astronaut Program, and provided technical and program support in the preparation of experiments for future Canadian missions. In February 2001, Marc Garneau was appointed Executive Vice President of the Canadian Space Agency and then President on November 22, 2001 before leaving in 2005 to pursue a career in politics. 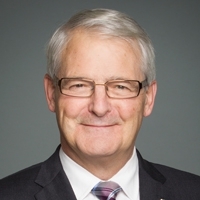 In October 2008 Marc Garneau was elected as the Member of Parliament for Westmount–Ville-Marie and, in his first mandate, served as the Critic for Industry, Science and Technology as well as the Leader’s representative for Quebec. He was re-elected in Westmount-Ville-Marie in May 2011 and served as House Leader in the House of Commons. He also served as the Critic for Foreign Affairs and La Francophonie. In October 2015, he was re-elected, in Notre-Dame-de-Grâce–Westmount. In August 2003, Marc was made a Companion of the Order of Canada, Canada’s highest civilian honour. He has also had two high schools named after him, Marc Garneau Collegiate Institute in Toronto and École Secondaire Marc Garneau in Trenton, Ontario.